All of the resources from across the site, here at your fingertips. We'll continually be adding more, so be sure to check back often! If you'd like to know more about any one topic, be sure to check out the blog for posts associated with that resource. 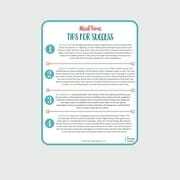 How to build a healthy and balanced plate for your newly eating baby, including types of foods to include and safety tips. 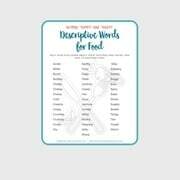 A list full of descriptive words to help teach yourself and your children to talk about foods with words other than "yummy" and "yucky." 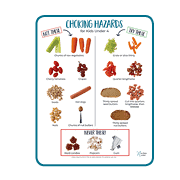 Vegetarian and animal sources of iron, including amounts in different foods, to help you plan a balanced plate for your children. Everything you need to know to start your baby on solid foods. When to start, how to start, and what to start with as well as what you need to buy before your start. 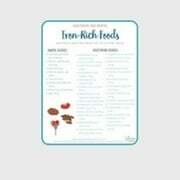 Are you tired of the same struggles with your kids around mealtimes? 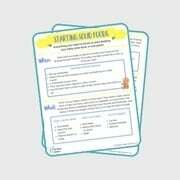 Here's a cheatsheet with tips that really work to help curb poor meal time behaviors. 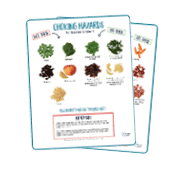 A handout for your fridge to help you plan and make balanced snacks that will keep your kids going between meals. 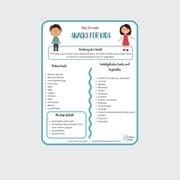 A list full of useful information for parents of babies, including suggestions on how to serve the foods safely. Includes both baby and older kids lists!